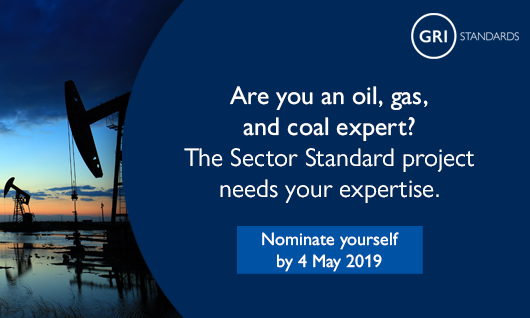 The GSSB is conducting an open call for nominations to join the working group for the oil, gas and coal Sector Standard, by inviting individuals from business enterprises, investment institutions, mediating institutions and civil society organizations, with extensive expertise on the sustainable development issues facing the oil, gas and coal sector. View the application form to apply. The development of Sector Standards, which will identify and describe impacts and stakeholder concerns, will be prioritized by the significance of their impacts on sustainable development.Ultimately, the aim is for the GRI Sector Program to cover up to 40 high-impact sectors. The Sector Standards will form part of the GRI Sustainability Reporting Standards, with organizations using the Universal Standards alongside relevant Topic Standards and the applicable Sector Standard(s). The project will follow the GSSB’s Due Process Protocol, which sets out that a multi-stakeholder project working group should develop draft recommendations for the project.